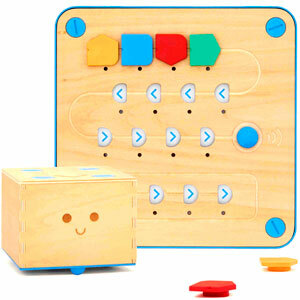 Cubetto, a little wooden robot from UK-based toy company Primo Toys, is designed to teach three- to six-year-olds basic programming logic with hands-on and screen-free play. Cubetto is designed to foster persistence and problem solving. Primo’s founders believe coding is the new literacy and should be introduced to young children the way they are taught reading. Cubetto aims to teach the ABCs of programming. The basic Cubetto Playset ($225) includes one robot, a board, 16 blocks, a world map, and one storybook. The entire set is made of sturdy, tactile materials. The Cubetto robot is an aesthetically simple wooden cube with two wheels and a friendly face. The board is made from the same wood with a plastic base. It has spaces in which up to 12 command blocks can be placed in sequence to create an algorithm, as well as spaces at the bottom where children can program a brief function to be repeated. The fabric world map is printed with a six-by-six grid of squares showing symbols that correspond to the world in Cubetto’s storybook. Altogether, Cubetto has seven kinds of command blocks. Four basic blocks come with the Cubetto Playset: green “forward,” red “right,” yellow “left,” and blue “function” blocks. Black “random” blocks and cream “negation” blocks are in the Logic Blocks set ($29), and purple “backward” blocks are included in the Directional Blocks set ($29). Cubetto is essentially a storytelling device. He is the main character. As kids read through each page of Cubetto’s story, they bring it to life with the robot and world map. If, in the story, Cube tto is solving a mystery that takes him over the river and around the tree, the directions at the end of the page will instruct the child to program the robot accordingly. Often, the instructions provide a choice of algorithms—pictures showing a sequence of blocks—and ask the child to choose the correct one. Other times the instructions will be a challenge, such as “Can you create an algorithm that takes Cubetto around the tree?” The coding directions frequently have multiple solutions and encourage trial and error. The coding skills, such as functions and debugging, are carefully scaffolded within the story. Coding terms, like “algorithm” and “function,” are woven into the instructions, making them a part of the child’s coding vocabulary. Additional stories, complete with new world maps, can be purchased individually ($29). Each new story involves new problem-solving opportunities, but the real power is in the way the books model the practice of using Cubetto to tell a story. Each mat is a new world where children can build their own stories. Cubetto is designed to be cross-curricular. It will fit well into a kindergarten or first grade curriculum, integrating easily into early mathematics and reading lessons. The additional maps and stories are great but not essential. Preschool teachers should be prepared to start slowly. Computational thinking might not come naturally to children under five, and they will need more time and support before they are ready for independent play. The Primo Educators webpage (primotoys.com/education)is full of teacher resources, including a teacher’s guide, lesson plans, and a map showing schools around the world that are teaching with Cubetto. Primo Toys also has a Playroom webpage with ideas from the community of families, classes, and kids who have found creative ways to play with the robot. Cubetto is a cube—an uncarved block ready to be transformed. Tape a marker to the robot and program it to draw a picture. Give it a costume or a disguise. The Playroom page also has video tutorials and manuals for children and adults. Here, kids can watch a quick video on how the random block works, or parents and teachers can access a detailed video with step-by-step instructions for fixing Cubetto’s turning angle in Arduino. It is clear that a lot of thought has gone into the Cubetto design and concept. The purposefully unstructured nature of Cubetto, combined with the fact that no additional device is required, will make it a wonderful addition to pre-K and early elementary classrooms. The playsets could get pricey, but a set of two or three for use in stations is quite doable for most budgets, especially with the help of the teacher’s guide, which includes contact information for bulk orders and grant-writing assistance. VERDICT Cubetto is a powerful teaching tool because of its simple versatility. By combining programming and storytelling, it taps directly into children’s natural inclination for imaginative play and is designed to inspire play that eclipses the provided materials. 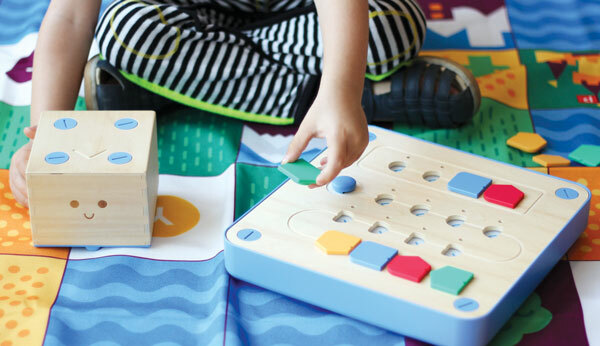 Primo Toys’ Cubetto is a high-quality investment for teachers and parents alike.